Crickets. It’s been nothing but crickets here. Why?!? Because something BIG is happening in our life here at RRF! We are moving! That’s right! And we are moving FAR! We e decided to uproot and replant ourselves in my hometown of Pittsburgh PA! I will miss so ,any great things about California. 🌴🌴🌴my backyard serenity buddy. A litter under ten years ago we moved out to the Bay Area and planned on not looking back. The older my children got the more my heart ached to be home and with my family. To raise my children alongside their cousins in a close knit community. It’s no secret California is ridiculously expensive. To top it off i live in Silicon Vally. The most expensive suburb in the nation right now. I can’t hack it out here and we want more children and that’s just impossible budget wise out here. Pittsburgh has everything a city needs and everything a small town has. There’s a reason it’s called the Paris of Appalachia. Friends feel like family and nearly my entire family is there! We set out the last week of February. I can’t wait to take the littles dahntahn(downtown) to ride the incline and dance barefoot at the Point folk music festival!! 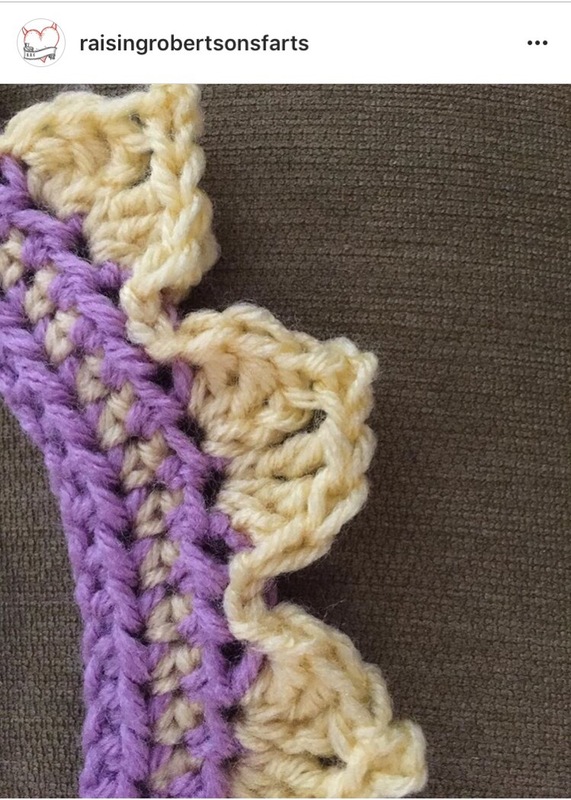 Pattern is worked in the round and uses single crochet. Stuff pattern tightly with polyfil as you go. 2-15.) sc in each st around. 1.) tail and hind legs. To hold in place you can either sew at the twist joint or use a glue gun on the pieces. Or both! Wool and where have I been?!? Let’s start by addressing my absense!! Where will this site be headed?!? 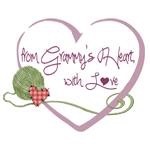 Slowly headed back to posting free patterns and fiber arts related content regularly. ROVING WOOL. 🐑🐑🐑That’s right. 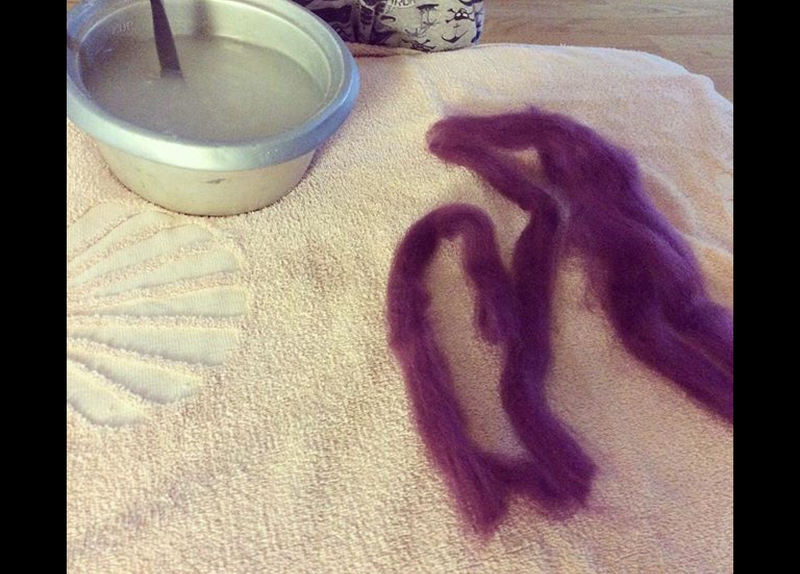 Good old raw roving wool of spinning yarn and felting. I stumbled upon a really cool new trend. 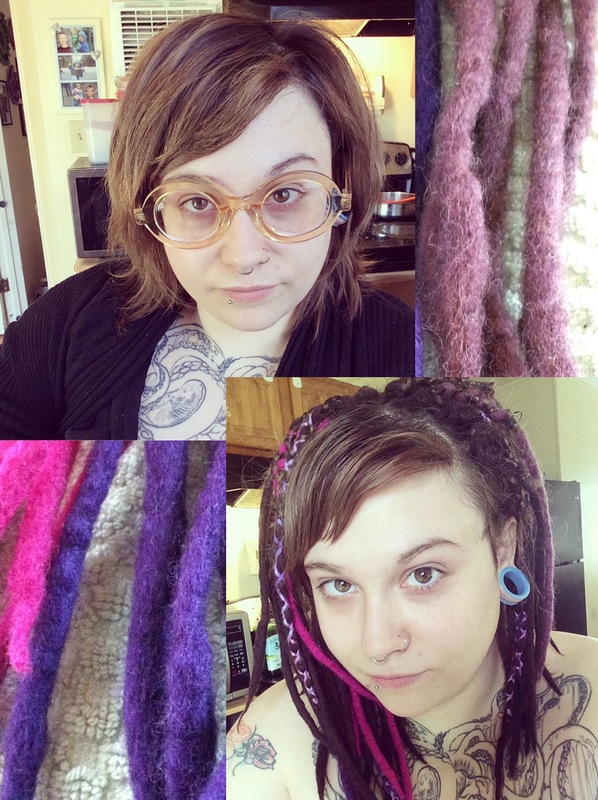 Synthetic dreadlocks. 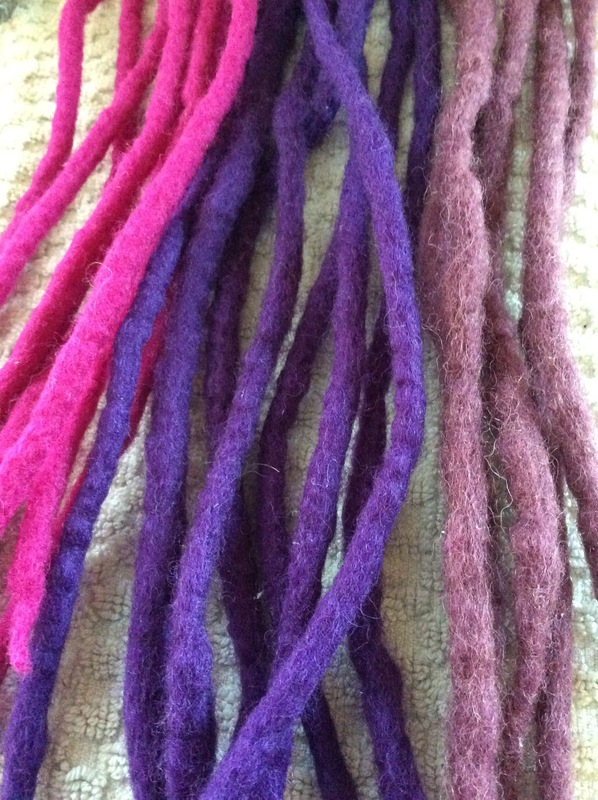 Now these dreads can be made using either roving wool or synthetic hair. 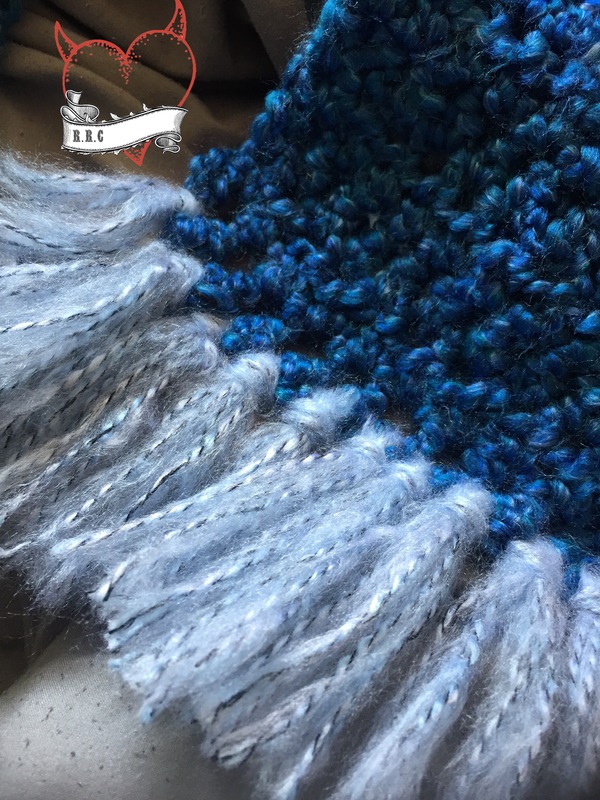 Wool is lighter and easier to make and wear but can look fluffier than hair dreads. I got my toes wet and ordered some roving wool from Wistyria Editions roving wool in one gram increments. I chose chocolate, lilac haze, grape, and berry. You can find those HERE. (Sneak peek of single ended dreads). How did I turn roving into dreads?!? Let me show you! *Roving wool. Divided into the thickness you desire. A neat trick is to twist the wool to measure the final thickness you wish to have. *boiling soapy water. I used dove bar soap. Works great! The water needs to be hot. You may need to reheat it multiple times during the rolling process. *kitchen dish gloves. The thick kind. The water is hot! *time. Lots and lots of time. These take FOREVER. And that’s for normal people without three kids and a house to clean. 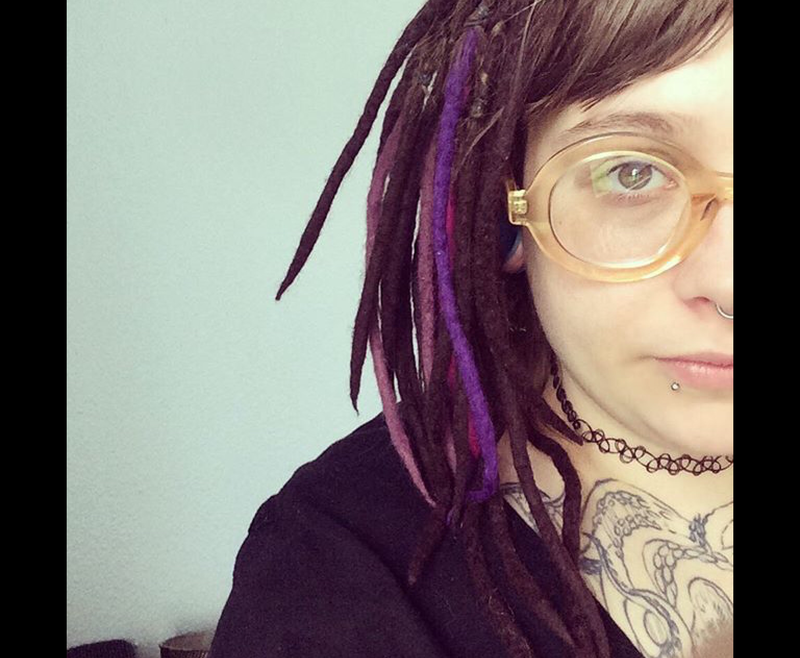 Now there are two different types of dreads. Single ended and double ended. Single ended is one dread with a loop at the end for your hair to go through. Double ended is twice the length of the single and resembles,just one long dread, tapered at both ends. 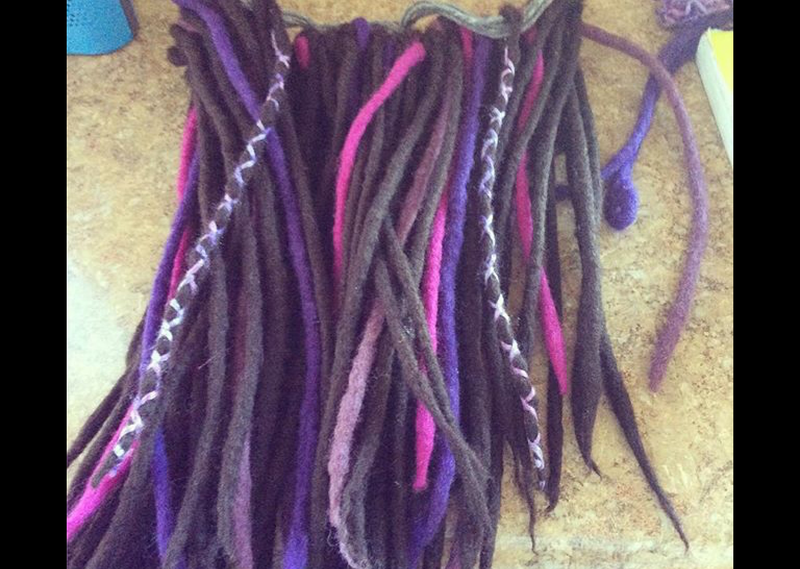 Another difference in dreads is you will need half of the amount of single ended dreads you would use if using double ended Technically a double ended will make two dreads when installed. 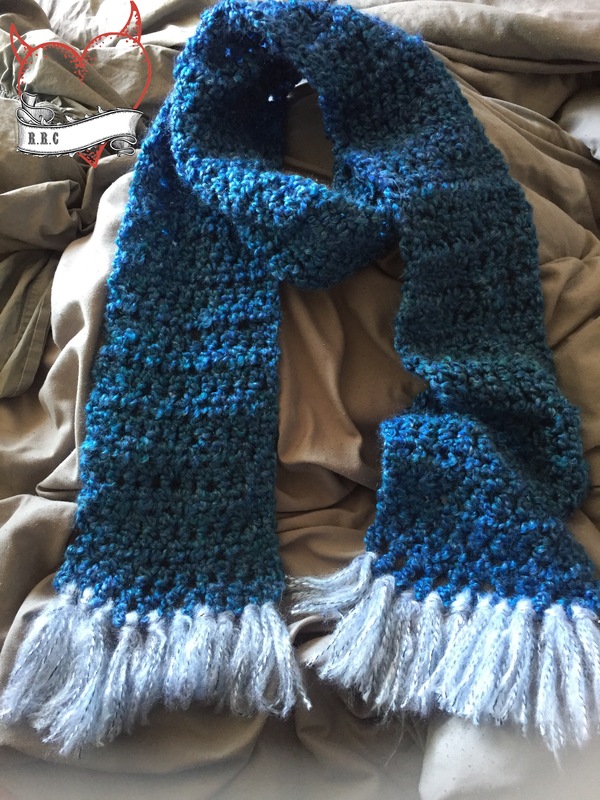 I decided to make single ended because my wool was shorter in length. About 12 inches. 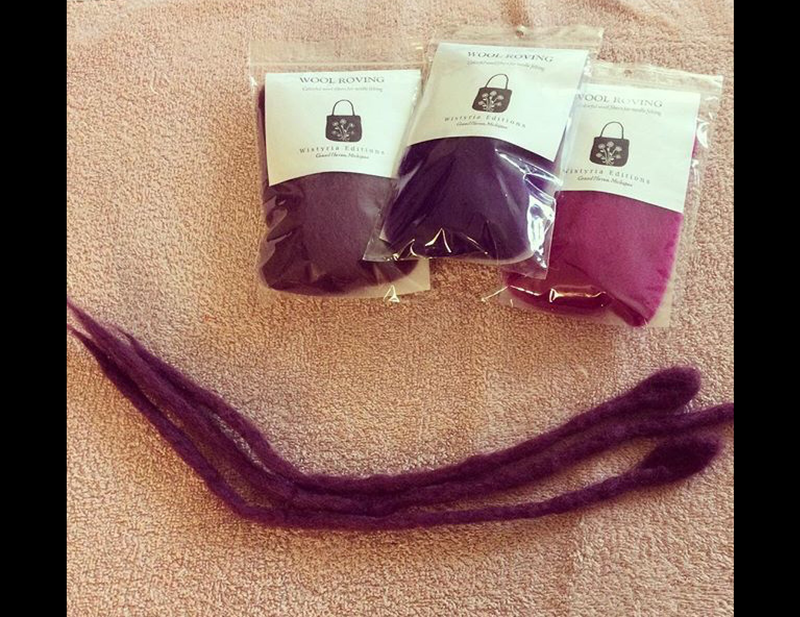 You can buy various lengths. I hope to work with 36 inch next time and attempt hip length synth sounds. For the first part of the dread you need to make the loop end. I used Tina Tianens video on how to create the ends. She includes TWO methods. You can see her video HERE. Once your dreads are ended you can start the rolling process. Did the dread into the hot water/soap solution. Begin to roll dread back and forth over the towel/bubble wrap like you would when making a dowel or rod. Add water and pressure as needed. Roll roll roll roll and ROLL!!! This is the part that takes forever. It really takes time and effort to get the dread formed. You will know it’s working when you are unable to split the dread fiber between your fingers It will be one rolled mat. For thick hair, you will need around 85-100 single ended dreads. That’s how many I made. Now let me say, it cost significantly less to make my own. Premade dread sets cost hundreds of dollars. It’s labor intensive. I can see why. Now to install! This also takes FOREVER but it’s worth it. Section hairnoff into four quadrants. You will work with one quadrant at a time. Using about 20-30 dreads perm quadrant. Take small size of hair, slightly smaller than dread itself. Pull hair through loop at end of dread. Separate hair into two even parts Using dread and two strands of hair, braid hair onto dread/with dread. When you reach the end of your hair, secure with tiny hair band. Repeat a bajillion times until hair is installed! You can keep the dreads in as long as 1-2 months. Possibly more depending on hair growth. Then they need readjusted or reinstalled. YES you can wash them! Wash your roots as normal. For the dreads themselves, dilute shampoo with water in small bottle or bowl. The dreads get VERY heavy when wet so make sure to really wring them out. I think that’s about it! I had this lamp that my middle son ripped a hole in. The hole was towards the Bottom so I decided to trim it above the hole for a quick fix. How bland and weird it looked so I decided to add some flair to the lamp and designed a fun fringe! This fringe can be used for anything that needs a funky trim to accessorize. When I took a step back I noticed it just wasn’t enough! I needed some tassels! With the help of Donna Wolfe of Naztazia dot com I had found the perfect tassel to add to my fringe! **Any length is fine as long as you ch multiples of 5 then add ch1 to account for starting st. 2. )ch1, sc in each sp across. Turn. (110sc). 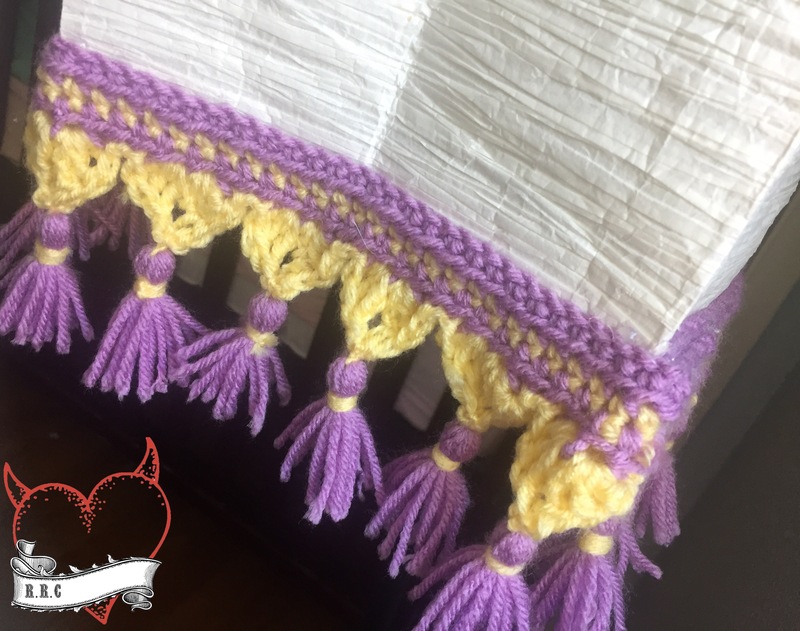 To attach to the lamp I used a hot glue gun and slowly attached the first three rows of fringe to the lamp leaving row 4 to dangle with the tassels. The cool part about hot glue is it dried super fast! Welcome to the world Virginia Marie!! 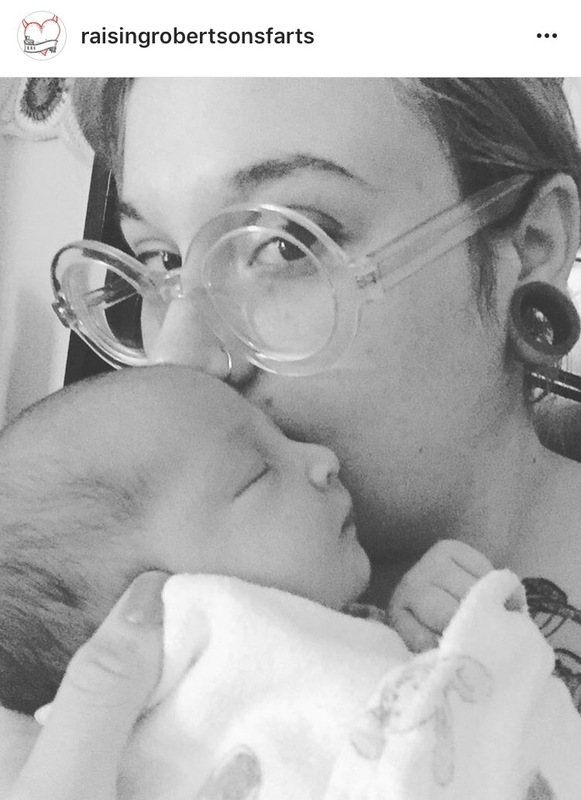 Our daughter was born ten days ago!! I’ve finally gotten around to making and update post for you all in the form of a ginormous pattern showcase too! Here she is! 🎀💜🍼 getting all cozy and settled in at home a few days ago at a week old. 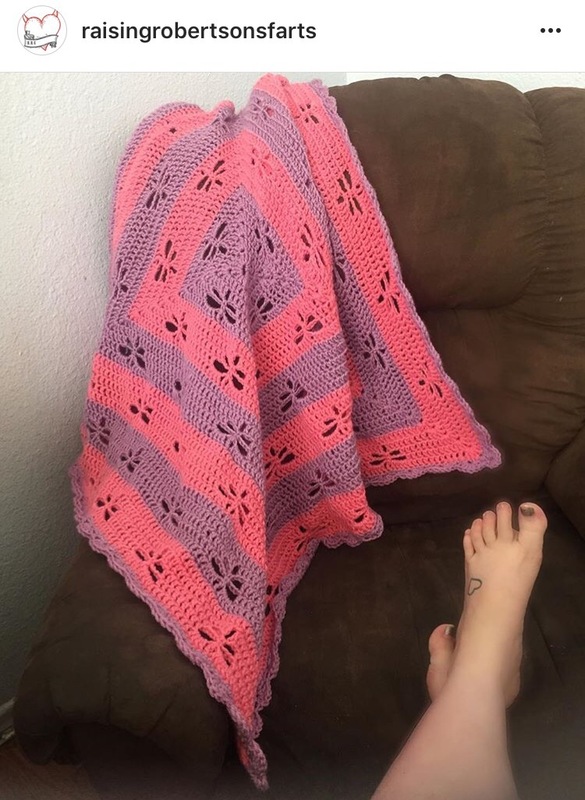 This blanket it the very first thing i ever crocheted for her. The blanket is a bunch of African Flower Hexagons assembled together. 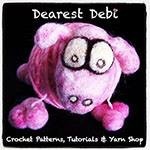 The pattern is by Heidi Bears Crochet and can be found HERE. And here she is just hours old! 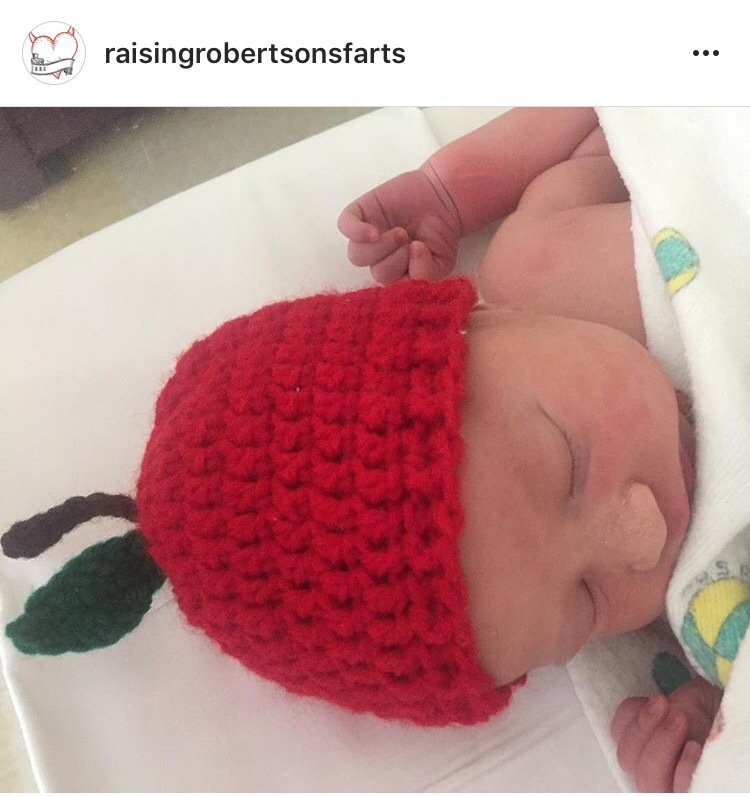 Getting all snugly in this cute Newborn Apple Hat. This pattern is a Cream of The Crop Crochet original and can be found HERE. 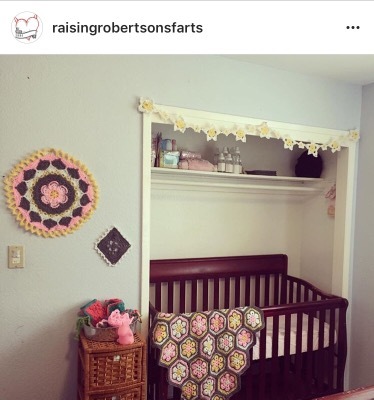 And now for the debut of her nursery and nursing nooks. I’ve been posting progress pics on my Instagram account but here I’ll be linking where to find the patterns I used to set it all up with! I whipped up this dragon fly mobile using the dragonfly appliqué pattern created by JKW Designs. The pattern for the appliqué can he found HERE. 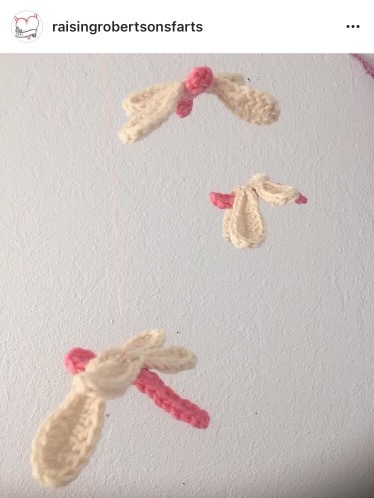 I had to match the darling mobile with a blanket to keep my baby and my boobies warm during feedings so I of course went with the ever popular radiating Dragonflies Throw by Pattern Paradise. This pattern can be found HERE. And now onto the Nursery Nook! 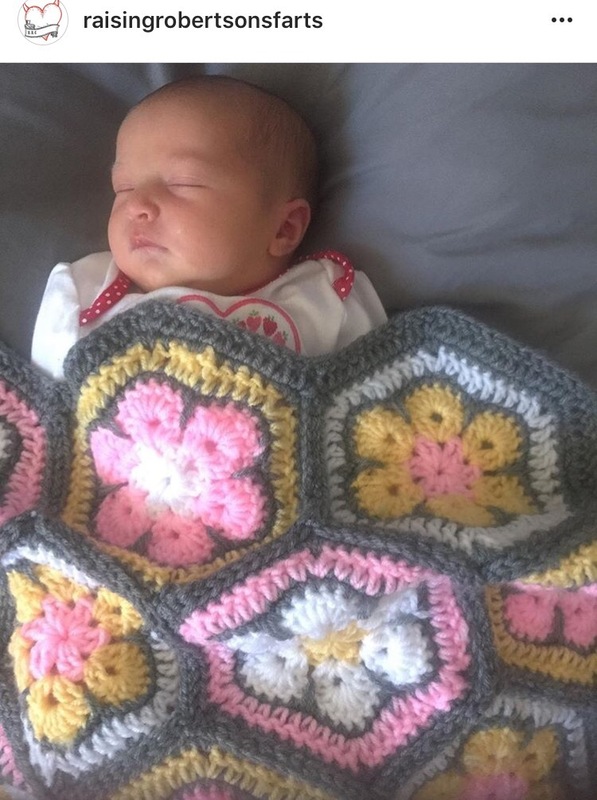 The blanket is the same blanket as I mentioned above using the African Flower Hexigon by Heidi Bears. 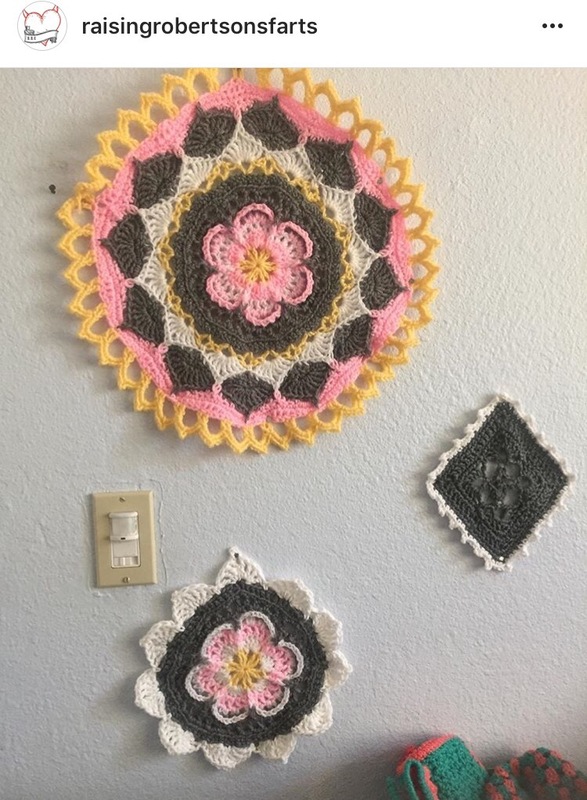 Making Mandalas has always been some of my favorite things to crochet! Top Left Mandala i made using Sophie’s Mandala in size Medium. Left side below is the size small of Sophie’s Mandala which both are designed by Look At What I Made. The pattern can be found HERE. Right hand side is the Star Bright square by Stitch11. 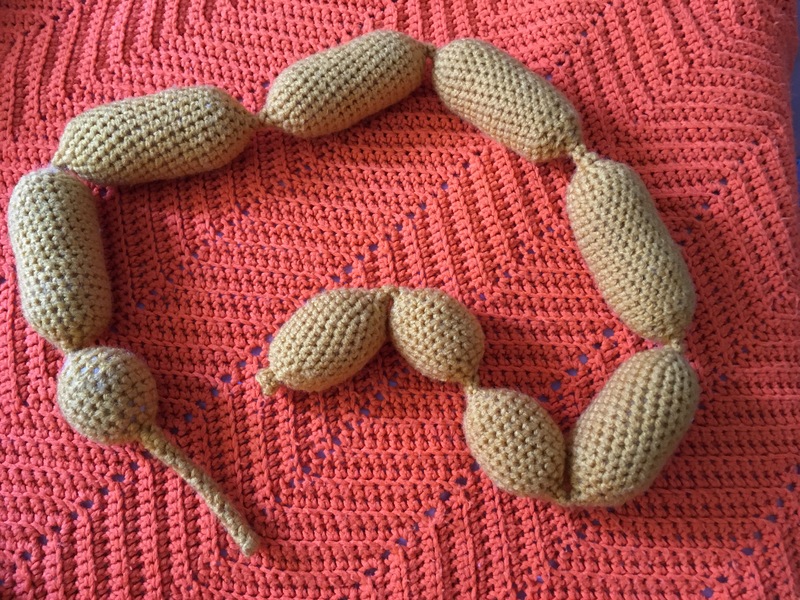 I edged the square with picots. The pattern for the Star Bright square can be found HERE. Lastly I made a ton of flowers and strung them up into a bunting. 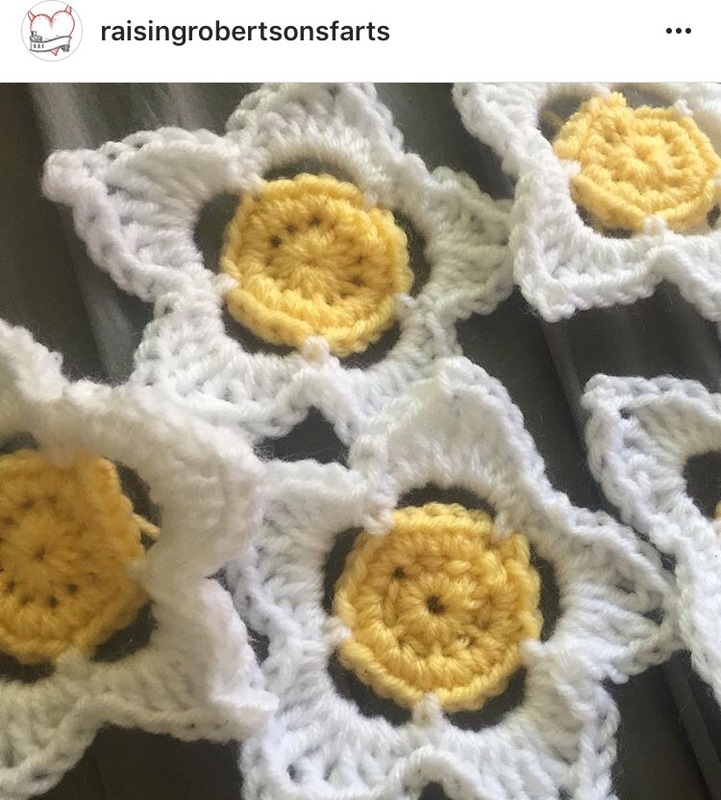 I used my very own Fast Flower pattern. You can find that pattern HERE. I’m beyond in love with this little girl. 🎀💜🎀💜🎀Her brother and daddy are too. 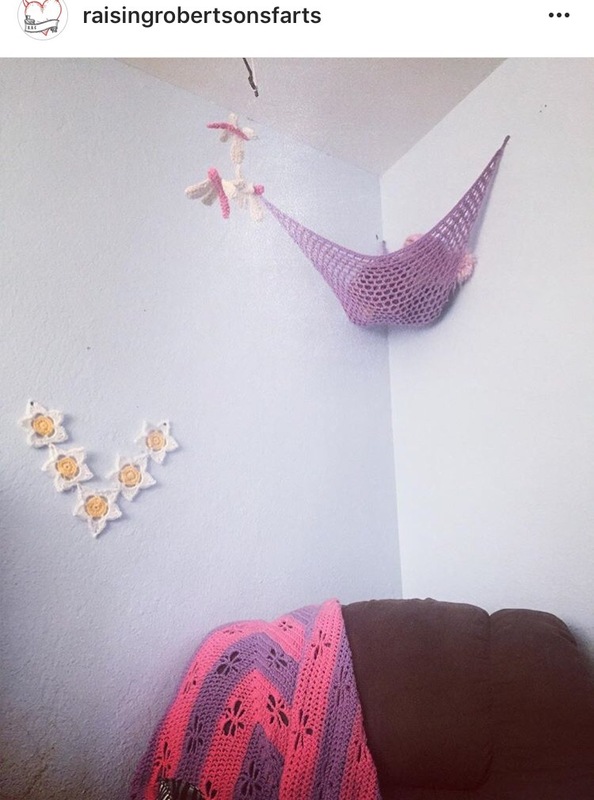 I’m happy I get to share her with all of you and I’m so glad I have crochet in my life so that my babies can be cozy and my eyes have some crochet candy to gaze over too. 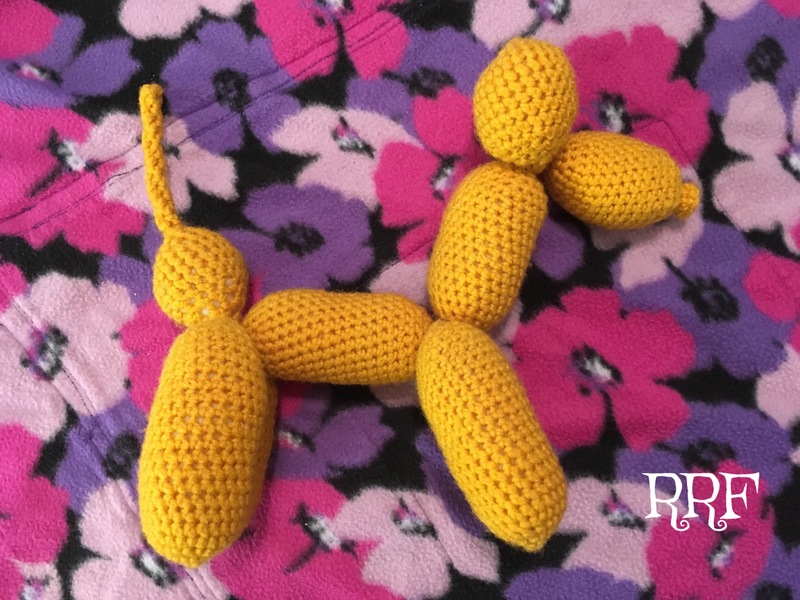 This pattern is copyrighted to Rebeckah Ferger of http://www.rebeckahstreasures.com. It is for your own personal use only. No part of this pattern may be copied or distributed in any way. If you sell what you make from this pattern, please credit “Rebeckah Ferger of Rebeckah’s Treasures” as the designer, and be sure to link to the above website if you sell online. *…** – repeat instructions between the two asterisks as directed. (…) – work the stitches between the parentheses into the space as directed. […] – work stitches between the brackets however many times called for. Special Abbreviation: *Picot = ch 3, insert hook into the v-ridge of the last st made, yo and pull though it right on thru the st and the ch-lp on the hook. See the first example in this video tutorial by Moogly (link: https://www.youtube.com/watch?v=MQmO74im2N0). Designed to fit a standard pencil or pen. The base of this pencil topper, the part that slips onto the pencil, is approximately 1” (2.5 cm) in height. 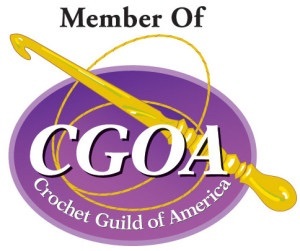 Gauge:20 single crochet stitches x 24 rows = 2” (5 cm), or 10 single crochet stitches fit around the pencil snuggly but not too tight. 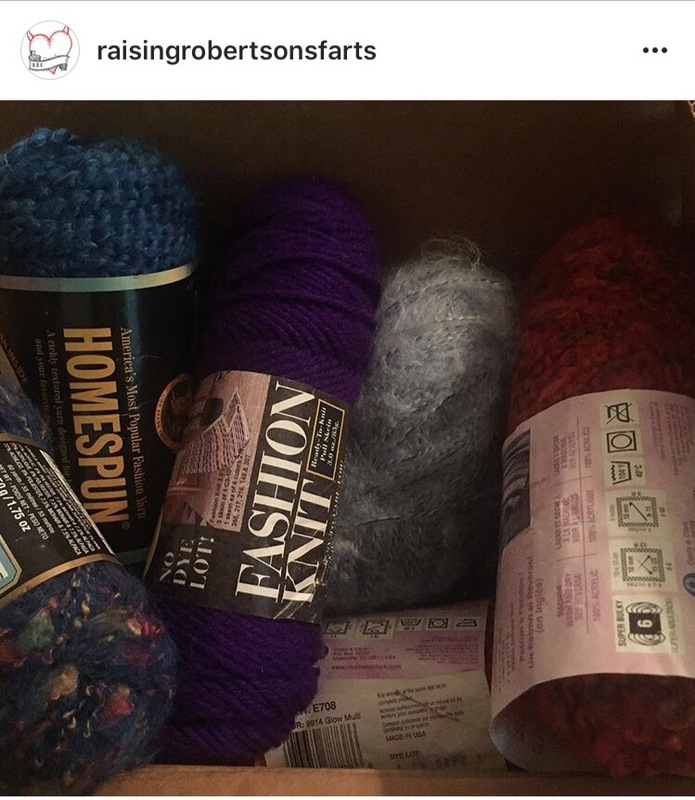 TIP: Thread/Yarn weight and hook size are flexible. Most lace or fine weight yarns will work well for creating a pencil topper. Whereas, thicker yarn weights such as DK or WW work great for turning it into a finger puppet. All you have to ensure before you begin, is 10 single crochet stitches wrap snuggly, but comfortably around the pencil, pen, chalk, finger or whatever staple you wish to accessorize! This butterfly pencil topper is worked in five parts. The first part creates the pencil topper base and antennae. The remaining parts create the wings. 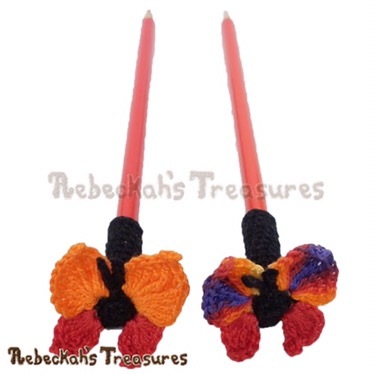 The base of this butterfly pencil topper is worked in continuous rnds from top to bottom. The third rnd creates the antennae and serves as a base for the wings to be worked into later. Work continuously and do NOT turn at the end of rnds unless directed otherwise to do so. *Side facing you = RS. rnd 1: sc 5 into a magic circle (5 sts). rnd 2: sc 2 in each st around (10 sts). tip: mark the 2 unworked BL sts so they are easier to find for the next rnd (4 ch-sps, 11 sts + antennae). *This is the wing base rnd. The taller sts are the tail or bottom of the butterfly. 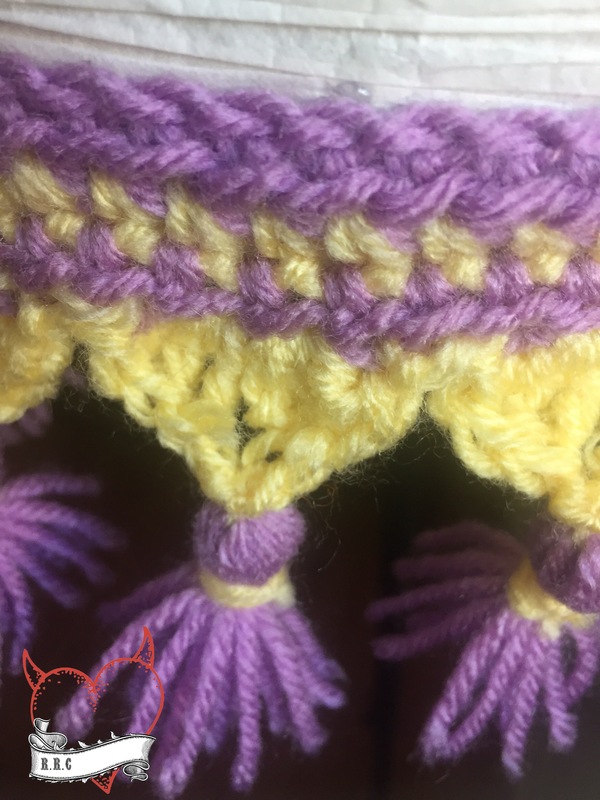 rnd 4: sc 2 in each skipped st from the prev rnd – pulling the ch-2-sps to the front of work so they stay on the RS or the outside of the butterfly, sc in each unworked BL from the prev rnd – it helps to pull the tail sts inwards towards you, so you can easily find the BL and work the last sts of this rnd (10 sts). rnd 5-16: sc 10 – 12 rnds or until desired height is reached, sl st & f/o at the end of the last rnd (10 sts). *The number of rnds you work here may vary according to your project and preference. 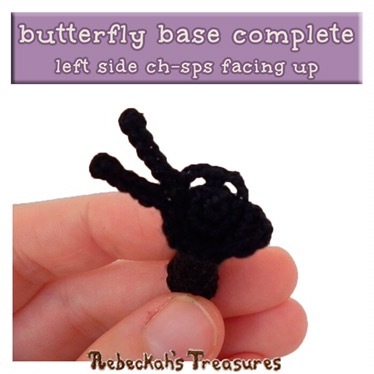 The bottom left wing of this butterfly pencil topper is worked directly into the ch-sp on rnd 3 of the base, nearest to the tail on your right, when looking at the butterfly base from above. *Side facing you = RS. 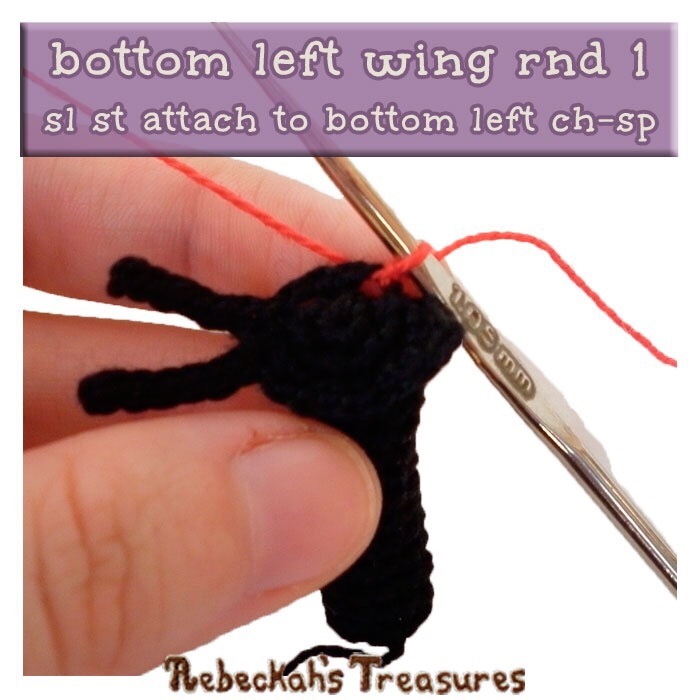 rnd 1: make a slip knot in bottom wing thread colour (red in tutorial) & with the RS or top of the base facing you → sl st attach to the ch-2-sp from rnd 3 of the base nearest to the tail on your right or the left of the butterfly, ch 2, (tr, dtr, picot, tr 2, dc 4, sc, sl st) into the same ch-2-sp, ch 1, f/o (10 sts). *The ch-2 in this set counts as one st. The top left wing of this butterfly pencil topper is worked directly into the ch-sp on rnd 3 of the base, nearest to the antenna on your right, when looking at the butterfly base from above. *Side facing you = RS. 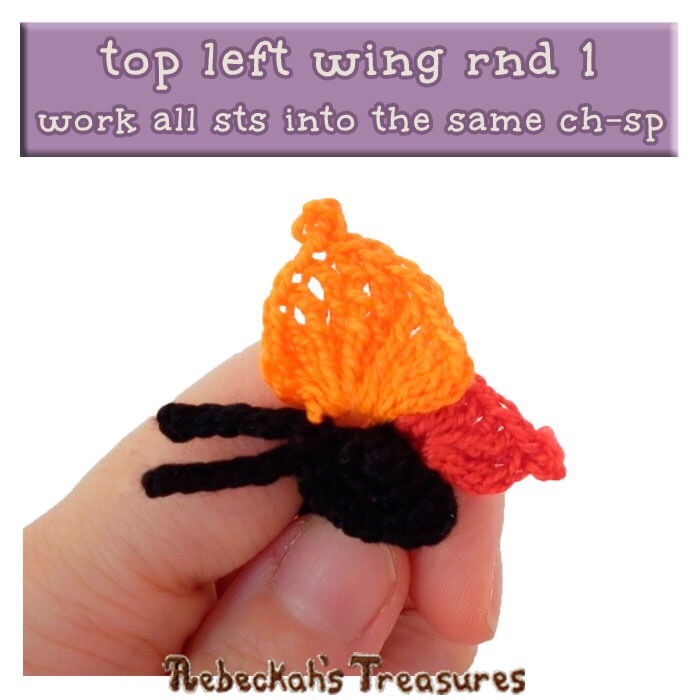 rnd 1: make a slip knot in top wing thread colour (orange in tutorial) & with the RS or top of the base facing you → sl st attach to the next avail ch-2-sp from rnd 3 of the base next to the antenna, ch 3, (tr 3, dtr 2, ttr 2, picot, ttr, dtr, tr, dc) into the same ch-2-sp, ch 3, sl st into the same ch-2-sp, ch 1, f/o (13 sts). 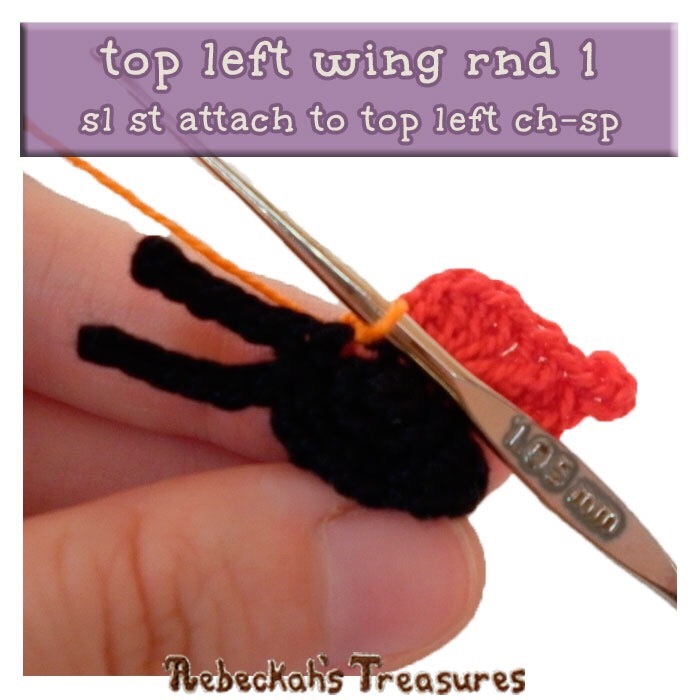 *Both of the ch-3 in this set count as one st.
rnd 1: make a slip knot in top wing thread colour (orange-red-purple in model) & with the RS or top of the base facing you → sl st attach to the next avail ch-2-sp from rnd 3 of the base on the other side of the antenna, ch 3, (dc, tr, dtr, ttr, picot, ttr 2, dtr 2, tr 3) into the same ch-2-sp, ch 3, sl st into the same ch-2-sp, ch 1, f/o (13 sts). *Both of the ch-3 in this set count as one st. The bottom right wing of this butterfly pencil topper is worked directly into the ch-sp on rnd 3 of the base, nearest to the tail on your left, when looking at the butterfly base from above. *Side facing you = RS. 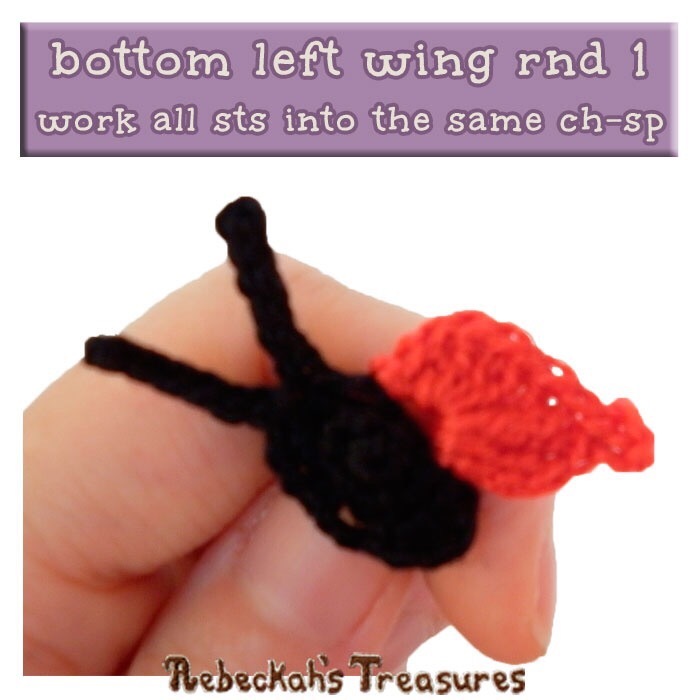 rnd 1: make a slip knot in bottom wing thread colour (red in model) & with the RS or top of the base facing you → sl st attach to the final ch-2-sp from rnd 3 of the base, (sc, dc 4, tr 2, picot, dtr, tr) into the same ch-2-sp, ch 2, sl st into the same ch-2-sp, ch 1, f/o (10 sts). *The ch-2 in this set counts as one st. Attach to your favourite stationery staple!